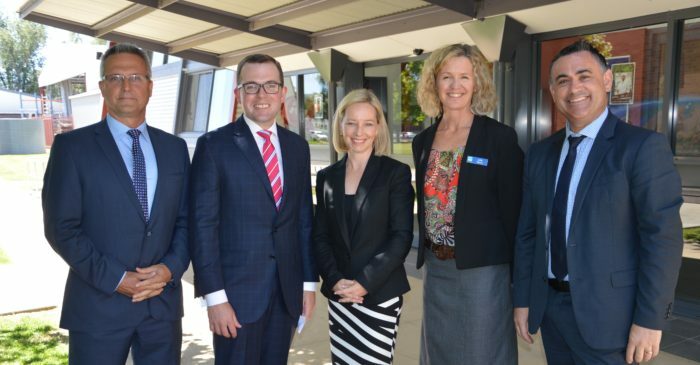 John Black – Managing Director TAFE NSW, Adam Marshall MP – Member for Northern Tablelands, Megan Aitkin – General Manager TAFE Digital, Lyn Rickard – Head of Education TAFE NSW and Deputy Premier John Barilaro – Minister for Skills. Armidale has been chosen as the home of the new headquarters for TAFE NSW Digital, providing state-of-the-art learning experiences for TAFE NSW students across the State. Deputy Premier and Minister for Skills, John Barilaro, and Member for the Northern Tablelands, Adam Marshall, made the announcement today at TAFE NSW Armidale campus, proving that technology can trump the tyranny of distance when it comes to digital jobs and learning. TAFE NSW Digital will be responsible for developing digital, world-leading content for use throughout TAFE NSW’s footprint. “The amount of students taking up online learning with TAFE NSW continues to grow and we are focusing our resources on meeting the demands of students,” Mr Barilaro said. Member for the Northern Tablelands, Adam Marshall, said he was excited that Armidale has been identified as the site for the new TAFE NSW Digital headquarters which will bring up to 40 new local jobs. “Armidale will become a central edu-tech hub with streamlined course content development, innovative and compatible opportunities for local Industries, and local partnerships with businesses in the region,” Mr Marshall said. The Deputy Premier and Managing Director for TAFE NSW Jon Black also announced the appointment of Megan Aitken as General Manager for the TAFE NSW Digital headquarters. The creation of TAFE Digital marks an important milestone in the One TAFE reforms which will see TAFE NSW become more efficient, modern and build on its well-recognised and respected reputation for delivering job-ready graduates.